Due to the adjustment of the CS:GO trading mechanism by steam officials, CS:GO items must wait 7 days after each transaction quotations starting March 30th. 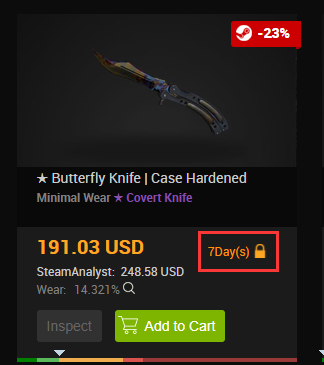 Therefore, after the seller deposits CS:GO items into IGVault inventory, the deposited items cannot be traded again within 7 days, so the seller will not be able to retrieve the deposited items immediately. If you have purchased an item in trading limit, it also cannot be retrieved before the transaction limit lift. 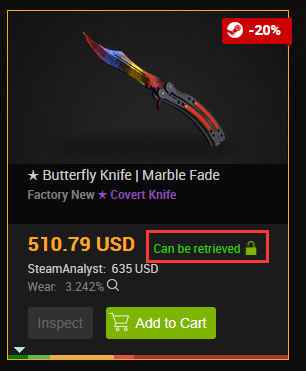 As the listing time of all CS:GO items is different, you can view the trading status of the item on the Selling Goods page at the time of purchase. The seller can "In Sale" and click on the item to view the item details page. This confirms the trading status of the goods sold. If the status is "can be retrieved", it means you can retrieve the item immediately . 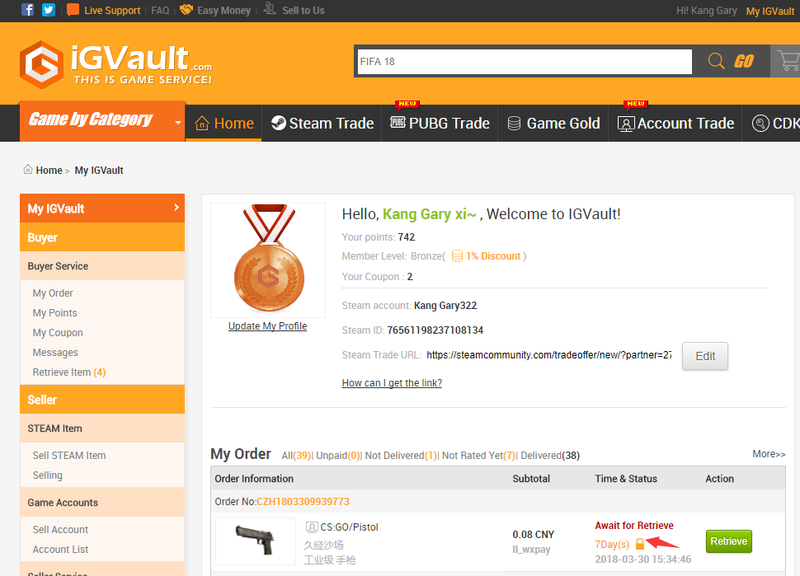 At the same time, as the buyer have to retrieve the item by accepting an trade offer IGVault bots, the item will also be untradable again within 7 days after retrieving. If the status shows "Limit Time + Yellow Lock Logo", you can retrieve the item after transaction limit passed. The seller can click on the item details in "Selling" to confirm when the item is released. 1. Display of the trading status of the goods on selling. As shown in the figure below, the message “can be retrieved immediately” is displayed, that is, the buyer can immediately retrieve the item after placing the order, and the seller can directly retrieve the item. As shown in the figure below, the item is in the cool-down period of the transaction, and it cannot be retrieved within the lock time. You can other “can be retrieved immediately” products. If you have a special liking for this item, you can place an order and wait for the item to be retrieved after the transaction limit is lifted. 2. If you have already placed an order, you can see the order details in "My IGV". You can check if purchased items can be retrieved immediately or check the remaining trading limit time. The seller can "Selling" in "My IGVault", and click on the item you want to view, then can jump to the item details page of the item to confirm the transaction status.